We like big butts and I know why: because it helps babies develop their brains properly. Researchers have found that especially during breastfeeding, the development of babies’ brains relies on fat supplies stripped directly from the mother’s thighs and bottom. Compared to men and other primates in the wild, females have much more total body fat. The distribution of body fat is also very different – with women having more fat and less abdominal and visceral fat than men, resulting in lower waist-hip ratios. Researchers wanted to see why this happens, and why women with high hip to waist ratios are generally considered more attractive. 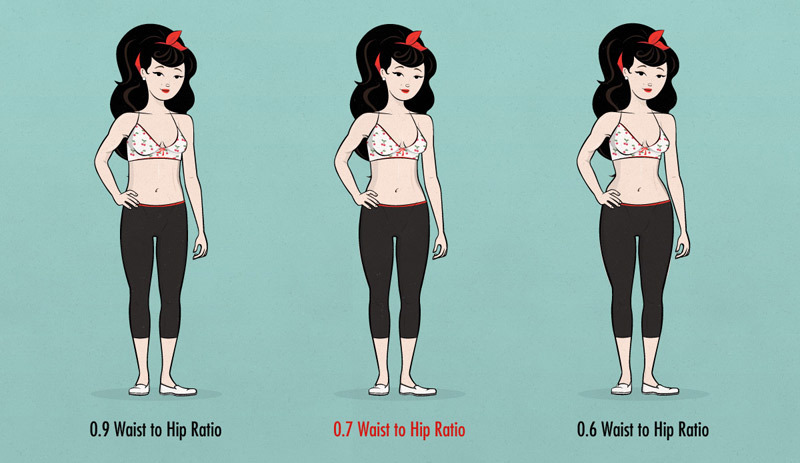 Different hip-to-waist ratios. Image source. They found that the quantity of fat on those areas of the body directly affect the baby’s chances of survival, as well as the child’s intelligence (though with a very small effect). This may indicate why men prefer curvier women. According to Professor Will Lassek of the University of Pittsburgh, the fats in women’s buttocks and thighs are high in a chemical called docosahexaenoic acid, or DHA. DHA is essential for the growth and functional development of the brain in infants. DHA is also required for maintenance of normal brain function in adults. The inclusion of plentiful DHA in the diet improves learning ability, whereas deficiencies of DHA are associated with deficits in learning. Until this study, researchers had basically no idea why women have so much fat. “Mammals’ and primates’ bodies typically have about 5-10 per cent of fat but in human women that rises to 30 per cent on average,” Lassek added. In a way, this is similar to hibernation – except the fat is not for feeding the woman herself, but rather her baby. It’s an interesting evolutionary trade which may have contributed to our development as a species. “This is similar to the levels seen in bears going into hibernation or whales living in cold Arctic seas. Women have traded muscle for fat so they are about a third as strong,” Lassek said. Scientific Reference: Waist-hip ratio and cognitive ability: is gluteofemoral fat a privileged store of neurodevelopmental resources?